This world holds a lot. Sometimes you see the kindest acts and the true good of people and you can’t help but feel happy and giddy. But, sometimes it’s as if the world has turned against you. Or even worse, everything is great but you still feel down and overwhelmed by itchy vibes. Especially if you are a highly empathetic person, you might pick up these itchy vibes even more often than most people. But don’t worry, Nature has something special in store for you – Sage. Sage is one of the oldest herbs that has been used ever since the dawn of time in all corners of the world. It’s one of the most often used tools for cleansing yourself, your home, workspace and even protecting it from those itchy vibes that you might have been picking up. Why is Sage perfect for cleansing? Sage is not only cleansing you spiritually but also physically. 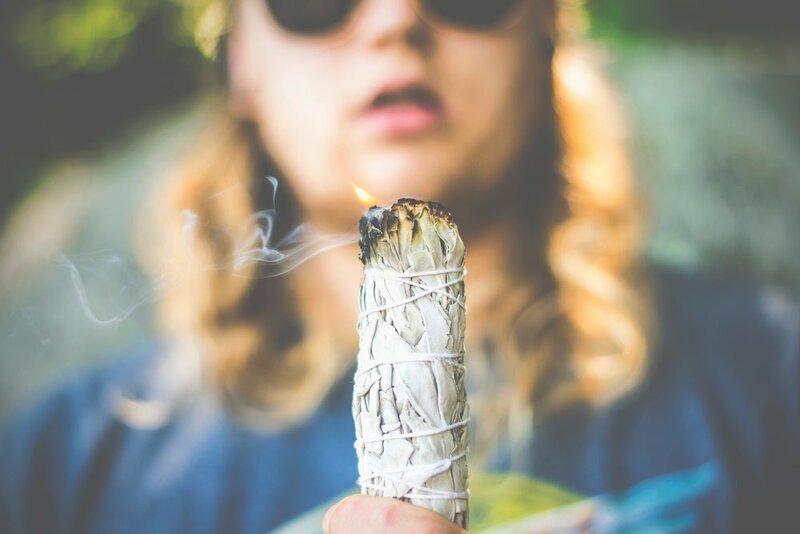 After several experiments, scientists confirmed that by burning sage you can disinfect your air – or to be more exact is clears up to 94% of airborne bacteria. Not only that but by inhaling the smoke you could also feel that your mood is instantly getting better, back to your natural, positive vibration essence. Well, sage does cleanse you spiritually and physically, but it also releases negative ions into the air which in several studies is linked to getting people in a better mood. See, we have a lot to teach you guys, it’s not all mumbo – jumbo! And if you are interested you can check our Magical Sage Cleansing Kit below and learn how to use it, and what each item serves for. 1. Always open doors/windows – Before you light your sage, always open a door or a window. All the itchy vibes will start moving, and if you don’t give them a way out of your home they might even do more harm. 2. Burning – In our kit, we have included two options for you to choose from – abalone shell or metal Goddess cauldron. Whichever you prefer is perfectly fine. Traditionally, people tend to use abalone shell more often. They are both great to holding the heat of the smudge sticks and helping you carry it around your home. 3. Feathers – They are usually used as smudging tools. When you light up your sage, you should use the feathers in a circle motion from your body towards the smudge stick – something similar to the motion of explaining something in conversation like on the picture below. 4. How to burn the sage – White Californian Sage as the one we use in our kit, is the best quality for cleansing purposes. When you take the smudge stick, light it. The sage will probably start burning in flames, but don’t panic – it is okay. Let it burn for about 20 seconds, then blow out the flame. Now the sage should be with orange embers on the ends. Extra Tip - It’s a common problem that sometimes sage won’t stay lit. This is probably because there isn’t enough space between the sage sticks and oxygen can’t get through so it can keep it lit. Carefully loosen you smudge stick and you are good to go! Now simply inhale the sage and let the smoke reach all the corners of your house. And if you want to cleanse your office, you can use sage essential oil or sage in a spray bottle! Remember to stay tuned to our blog to even more awesome content! Don’t forget to check out our shop and spell kits featured below!